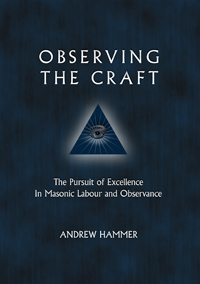 Written by Andrew Hammer, Master of one of the world's most prestigious Masonic lodges, Observing the Craft is a manifesto of sorts for the observant Mason, who seeks quality over quantity in every aspect of Freemasonry. 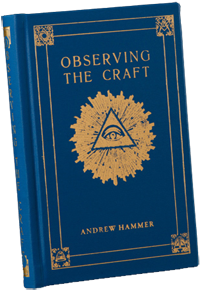 It is a stringent argument for the Symbolic Lodge as being the whole of Masonry, calling for nothing but the utmost effort and commitment to be put into the operation of a Masonic lodge and its meetings. NOTE: We have been informed by our customers that orders sent to Canada may take up to 3 weeks to arrive. This is a limited edition hardbound book, designed in the style of the 19th century, with gilded trim. Presentation page included for inscribing as a gift to another. This has proven to be a extremely popular edition since its release in 2012. Hardback: 248 pages; Classic edition (2012), 4.25"x 6.75"
Since January 2013, The United States Postal Service has raised shipping rates on packages to Canada by up to 100% and more. This is an outrageous development, but there is nothing we can do about it on our end. As a result, we have had to raise the Canadian prices across the board on our books to meet this idiotic, trade-damaging decision. We are actively pursuing production and distribution in Canada in order to avoid the overpriced rates from the US.